In 1853, Queen Kalama leased 4.6 acres of land to William Hillebrand, a botanist as well as a physician; he and his wife built a home in the upper terrace area of the present garden. The magnificent trees which now tower over this area were planted by him. Six years after his arrival, he and nine other Honolulu physicians petitioned to charter an organization called the Hawaiian Medical Society. Today, it is the Hawaii Medical Association. Appointed physician to the royal family at The Queen’s Hospital (now The Queen’s Medical Center), Hillebrand also served as chief physician at the hospital from 1860 to 1871. After 20 years, Hillebrand returned to Germany, where he published Flora of the Hawaiian Islands in 1888. In 1884, the Hillebrand property was sold Thomas R. Foster and his wife Mary E. Foster, who continued to develop the garden at their homesite. In 1919, Foster leased two-acres to the Hawaiian Sugar Planters’ Association for its experiment station, under the direction of Dr. Harold L. Lyon, a botanist and plant pathologist. Lyon proceeded to build on the work of plant conservation and landscape architecture which Dr. Hillebrand and Mrs. Foster had initiated. By 1925, his plant nursery had produced over a million trees, most of them exceptional varieties which were not grown elsewhere. Hundreds of new species of trees and plants had been imported, cultivated and distributed throughout the Hawaiian Islands. Upon Mrs. Foster’s death in 1930, the 5.5 acre site was bequeathed to the City and County of Honolulu as a public garden and was opened to the public on November 30, 1931, with Lyon as its first director. Over a span of 27 years, Dr. Lyon introduced 10,000 new kinds of trees and plants to Hawaiʻi. The Foster Garden orchid collection was started with Dr. Lyon’s own plants. Taken as a whole, these five gardens feature rare species from tropical environments ranging from desert to rainforest, comprising the largest and most diverse tropical plant collection in the United States. In addition to being a pleasant place to visit, Foster Botanical Garden is a living museum of tropical plants, some rare and endangered, which have been collected from throughout the world’s tropics over a period of 150 years. Today the garden consists of the Upper Terrace (the oldest part of the garden); Middle Terraces (palms, aroids, heliconias, gingers); Economic Garden (herbs, spices, dyes, poisons); Prehistoric Glen (primitive plants planted in 1965); Lyon Orchid Garden; and Hybrid Orchid Display. It also contains a number of exceptional trees, including a Sacred Fig which is a clone descendant of the Bodhi tree that Buddha sat under for inspiration, a sapling of which was gifted to Mary Foster by Anagarika Dharmapala in 1913. In 1975, the Hawaiʻi State Legislature found that rapid development had led to the destruction of many of the State’s exceptional trees and passed Act 105 – The Exceptional Tree Act. The Act recognizes that trees are valuable for their beauty and they perform crucial ecological functions. 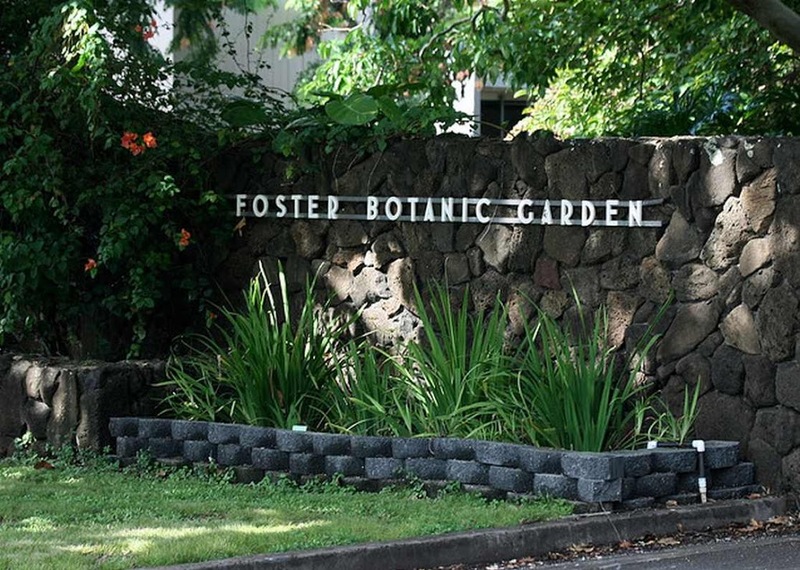 All told, Foster Botanical Garden contains 25 of about 100 Oʻahu trees designated as exceptional. In addition to this image, I have added other Foster Botanical Garden images in a folder of like name in the Photos section on my Facebook and Google+ pages.